George Nieuwenhoven ... "Greg, Nice plant, I have recently looked on the internet in vain for a photo of T. andreettae and lo you have one in flower, thanks." Peter Tristram ... "George, that's because this plant went as Vr. rauhii (now T. werneriana) until we recently put the debate to rest, for the moment. Unfortunately the description of Vr. andreettae doesn't seem to cover the range of this species group but it's much closer to it than Vr rauhii/T werneriana. The description says andreettae always has a simple spike and it was compared with TV cereicola to which it is certainly closely related. Erik posted some neat habitat pics recently too. I think many descriptions should be treated as a guide as they seem to represent a small proportion of a natural population. All of these TVs are in the proposed Tillandsia subgenus Pseudovriesea." Greg Aizlewood ... "Thanks for the comments. This plant I would love to grow without the leaf tip die back. It appears after rain so I am going to grow it under cover and a little dryer and see what develops. Some T. capitata have responded positively to this treatment. Greg Jones 12/18 as 'T/V species Peru, ex. Tristram'. Derek Butcher ... "If you are after a name it looks pretty close to T. andreettae to me." Peter Tristram ... "I’d say it’s in the T. andreetae group. There are many variations, in size, leaf structure, branching and intensity of bract colour. It’s so easy to grow too! The plant was on a shelf with Knize plants and this one bloomed but was chewed. I didn’t know KK sent in andreetae after about 1995. Nice branched form too." Similar to an unbranched form of V. cereicola (Mez) L. B. Smith (Syn. Vriesea lopezii L. B. Smith, Samne-Camiche, 1800 m, Dptm. La Libertad, Prov. Trujillo, North-Peru) ( fig. 15) but differs from this as follows: plant in all parts smaller, only with short stolons; Inflorescence always erect, doesn't hang, 10-15 cm long. Petals deep dark-blue-black; stamens enclosed, only style protruding with green to azure stigma. Etymology: the plant is named in honour of Father Angel Andreeta, Cuenca, Ecuador, who accompanied me on this trip. Plant flowering about 40 cm high, stemless, with short stolons, often in large groups. Leaves numerous, forming an erect, lax, to 20-30 cm high and 30 cm wide rosette (fig. 13). Sheaths distinct, 4,5 cm long, 2,5 cm wide, both sides brown scaled. Blades narrow-triangular, filiform, long acuminate, both sides densely silver-gray scaled, ± 20 cm long, above the sheath 1,5 cm wide; edges bent to form a groove. Scape erect, thin, 14-20 cm long, so long as or shorter than the rosette leaves, 3 mm thick, rounded, dark-crimson, bald, weakly long furrowed. Scape bracts densely imbricate, erect,adjacent to the scape and enclosing it, longer than the internodes, dark-red, grey scaled, basal ones with short blade, the upper ones bladeless. Rhachis green, straight, flattened, glabrous, at anthesis partially visible. Floral bracts densely distichous, 2,6 cm long, at widest 1 cm wide, lanceolate, acuminate, ecarinate to indistinct carinate, weakly scaled to glabrous, nerved (particularly when dried ) dark crimson, tips at anthesis already dried off, longer than the sepals (fig. 14, right). 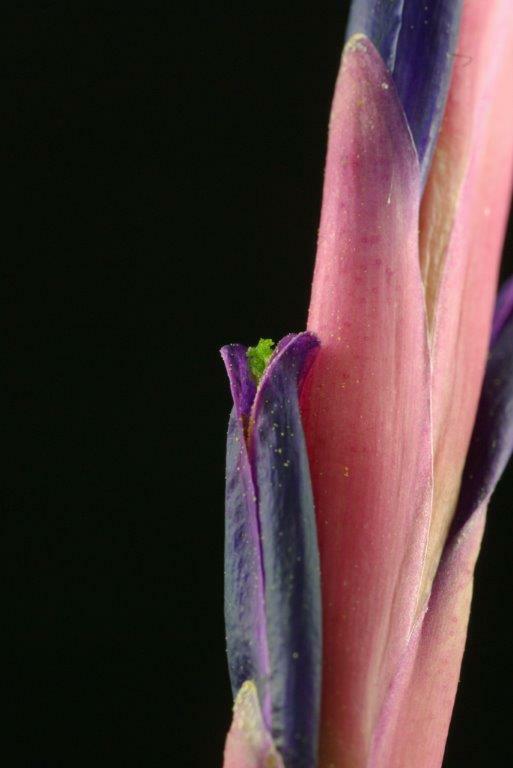 Flowers erect to spreading, short stemmed, (stem 1,5 mm long), 3,5 cm long, (fig. 14, right). Sepals 2 cm long, exceeding the floral bract, 5 mm wide, lanceolate, long acuminate, glabrous, thin membranous, red to green, free, nerved, towards the tip with a thickened mid rib and carinate. Petals 3-4 cm long, 4 mm wide, dark-black-blue, acuminate, spreading a little, at the base with 2, ± 4 mm long, white, entire edged ligulae. Stamens enclosed in flower, Filaments 1,8 cm long, straight. Style 2,4 cm long, stigma green or azure which exceeds the flower. Holotype: Rauh 38 140 (June 1975), in HEID. Habitat and Range: on rocks, High Pass of Pachamama, road Sta. Isabel - Pasaje, Prov. Azuay, South Ecuador. The plant numbered 52 972 (June 1980) was collected from the same location. V. andreettae resembles V. cereicola in habit, which occasionally has a simple inflorescence; which is however usually hanging, with a flexuous, excavated Rhachis and blue-violet Petals; stamens and style far protrude, (fig. 15). The high Pass of Pachamama, which means like “rocks of the mother" (1650 m high), is not only a wonderful boulder-landscape caused by rock falls but forms also a weather-shield between the western Andes and the inner Andes at the same time, to the kalf desert dry valley of Sta. Isabel-Giron. Moisture laden the wind rises from the Pacific ocean into the narrow valley of the Rio Jubones, (Machala - Pasaje – high Pass Pachamama) condensing the moisture to form dense cloudbanks, that begins from the east to lie over the High Pass (fig. 16, left). With the approach of high humidity, a rich Epiphytic vegetation, not only from lichens, develops on steep rocks and on the boulders you find (Usnea -, Parmelia-species), but also Bromeliads. 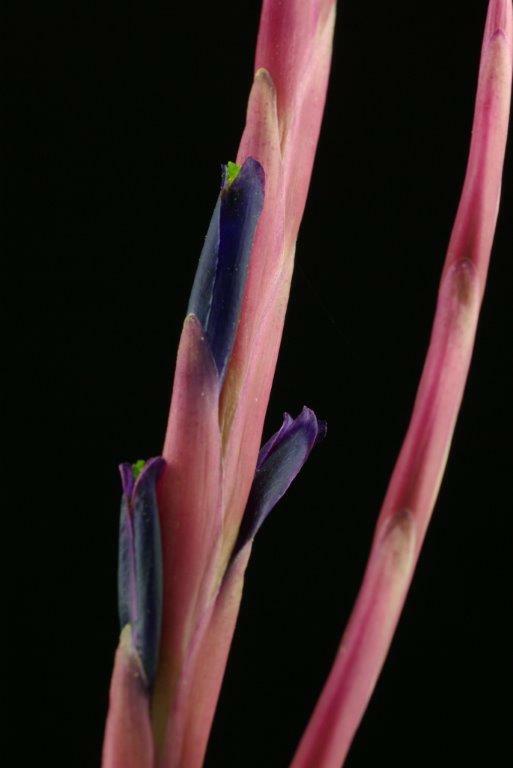 Snow-white Tillandsia tectorum (fig.16. right) appear on steep rocks and boulders many times, including a virtually stemless form. 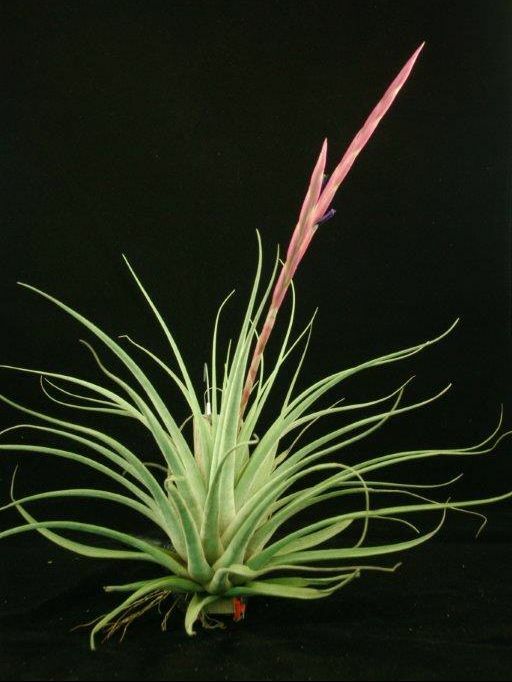 The Ecuadorian form is the most attractive of all T. tectorum forms. It grows with an undescribed form of T. disticha, (to 50 cm high, with long stolons at the base), T. mima, a very large funnel Tillandsia with grey waxy spiles, (not descernible, fig. 16, left), T. caerulea, T. latifolia var. divaricata, Pitcairnia heterophylla, Vriesea cylindrica, a Loxanthocereus with light carmine red flowers and Peperomia species. With all these plants, Vriesea andreettae is socialized, just as another new Vriesea, that will subsequently be described as V. olmosana var. pachamamae. Between the boulders, there is a a shrub vegetation with one grey leaved Croton species, Peperomia species, P. resedaeflora, a half-succulent species, Cnidoscolus spec. (“Mala mujer"), Jatropha macrantha. Below the High Pass in direction of Sta. Isabel Bromeliad vegetation starts and the dry vegetation becomes prevalent. Over gigantic flat areas grows Croton bushes, cactus plants, among which are a white-fleecy, Espostoa species from the melanostele group, Opuntia macbridei, Opuntia pestifer, the succulent Euphorbia weberbaueri and a single tree of Acacia macracantha. PLANT: forming dense clusters because of having short stolons, flowering up to 40 cm high. Rosette leaves numerous, forming dense rosette slightly inflated at the base, 20-30 cm high and 30 cm in diameter. BLADES ca. 20cm long, 1.5cm wide next to sheath, narrow triangular, long attenuate, erect, silver-gray lepidote on both sides; above partly carmine red. SCAPE: 14 – 20 cm long, 3mm thick, erect, red, thin, as long as the leaves. SCAPE BRACTS: densely imbricate, longer than the internodes, enfolding the scape, without blade, only acute up to 5 cm long, dark wine red, gray lepidote, the upper ones transforming gradually into the floral bracts. SEPALS: membranaceous, lanceolate-ovate, up to 2 cm long, reddish in the upper part, greenish at the base, free, the posterior ones carinate. STAMENS deeply included; the green style with the stigmas slightly exserted. We re-collected this nice tillandsia-like species again in July, 1980 (Rauh Nr. 52 972). 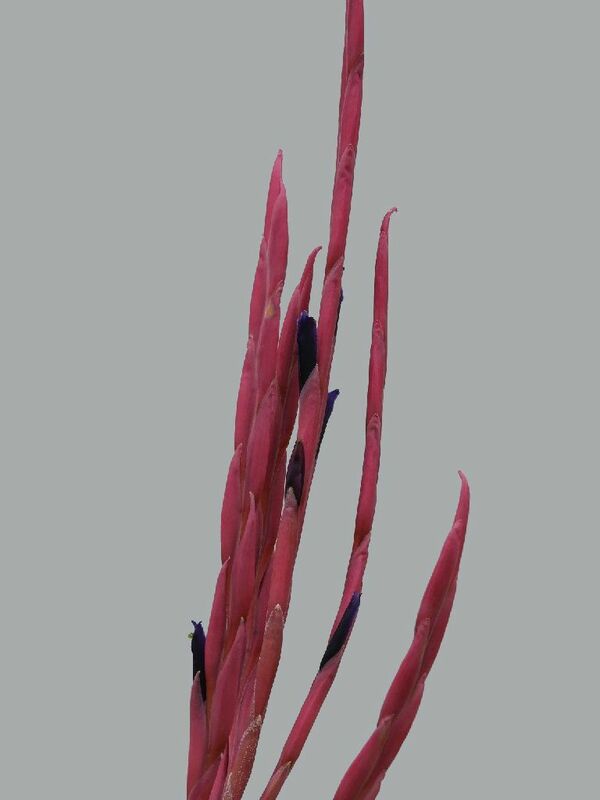 It grows with 2 other new species of Vriesea which will be described later. According to Lyman Smith's key, Flora Neotropica, "Tillandsioideae", 1972, Sub key II, Vriesea andreettae is related to V. cereicola (Mez) L.B. Smith, which also sometimes has simple inflorescences, but these are pendulous and the stamens are long exserted; furthermore, V. cereicola is known only from central and northern Peru. Regrettably I will not be able to help you very much. 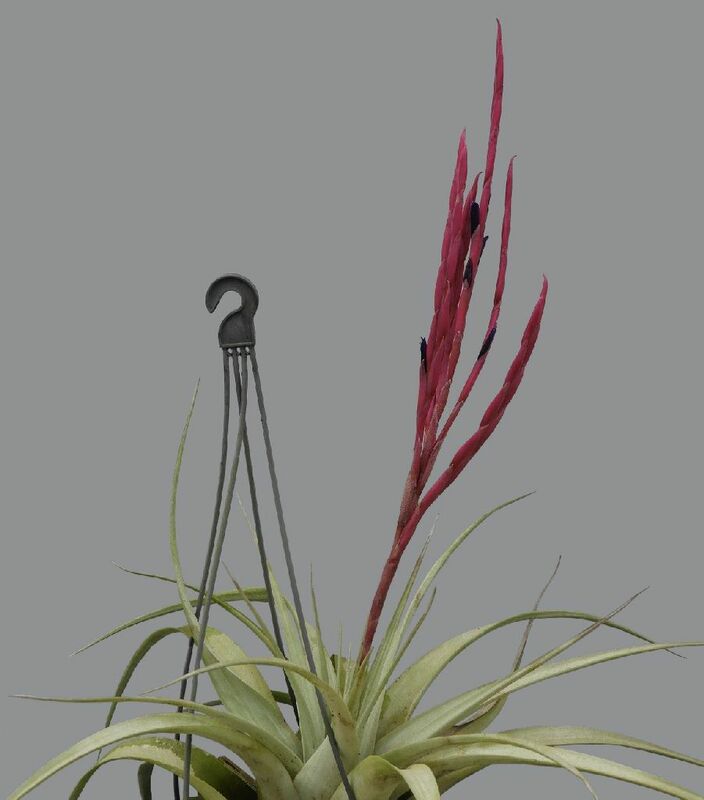 Most of my writings have been on misidentification in these Vriesea / Tillandsia look alikes. They are sold by the collectors under one name and when they flower for me I find they could easily be something else. I have many copies of herbarium specimens sent me by Harry Luther and he agrees with my thoughts that there must be others out there that need investigating before we get any idea of the complexity. In all probability you could find yet another missing link! Vegetatively they look so similar which is why they have not been fully collected before. If you find any in flower take photos and closeups and the exact locality and we can throw ideas around. It is a botanical nightmare but then you will say "What is different?" By the way V. andreettae was found on the road between Cuenca- Passaje at 1600m between km52 and km104. There is a lot of space in between! Hi Derek, just came back from Ecuador. I was lucky to find Vr. andreettae at what I believe must be the type locality. Actually it was very difficult to find the place, because Rauh said that it grows at Pachamama Pass between Santa Isabel and Pasaje at an altitude of 1600-1650 meters. But there is nowhere a point higher than 1400 meters along that road west of Sta. Isabel! In fact, there is no Pachamama pass at all! The reason would have been impossible to find out without speaking spanish fluently: There used to be another road 20 years back, much higher up in the mountains, and through a much moister habitat! I went there, the road is partially overgrown and only accessible by horse or walking! It was damn windy, chilly and moist, water dripping from the tillandsia loaded trees as well as my hair. After walking about 3km I reached what locals call "Pachamama" and after looking around a bit I could spot a group of plants growing on a rock about 10m above the "road". Vr. andreettae! Altitude 1670 meters. I climbed up which turned out to be quite dangerous, but it was exciting to see the plants from short distance. Vegetatively I would have put it under Vr. cereicola but one erect simple inflorescence (dry) was visible so it had to be andreettae. Despite the bad weather I was of course quite happy to have found the plant. Unfortunately it was already after 4pm and I had to hurry to get out of there! Reason for which I could not find the other species from that locality, namely, Vr. olmosana var pachamamae. But the visibility was too bad anyway, hardly good enough to make some photos (we'll see later). There was only one plant (out of about 30 in total) with a dry, but clearly simple inflorescence, just like the one in Rauh's original description and the second in your article on fcbs.org. I am kind of "not-so-sure" about the first one also belonging to the species, however. BTW: I know that Eric Gouda also collected the species "near Giron" but that's about 50km away! Perhaps his input would be helpful here as well.